Click here to see WCCUSD’s agenda minutes from this meeting. Welcome to Board Watch for WCCUSD Board of Education’s March 21st meeting! This week, our board members are scheduled to reconsider Resolution No. 64-1718: Intent to Transition from At-Large to Trustee-Area Board Elections after some procedural questions and resulting confusion at the last discussion of this topic. In addition, the Board is being recommended to ratify tentative agreements between the District and United Teachers of Richmond (UTR), as well as with the West Contra Costa Administrators Association (WCCAA) and the School Supervisors Association (SSA) / International Federation of Professional and Technical Engineers (IFPTE) Local 21. Click here to see the full meeting agenda. DATA IN ACTION // Back at the September 6th Board of Education meeting, our District staff presented to the Board and public on how data analysis actions, processes, and procedures would be carried out this school year in service of improving our students’ outcomes. At this time, Associate Superintendent Nia Rashidchi shared assessment data, and teams from school sites across West Contra Costa shared how they use data for collaboration, instruction, planning, and continuous improvement. 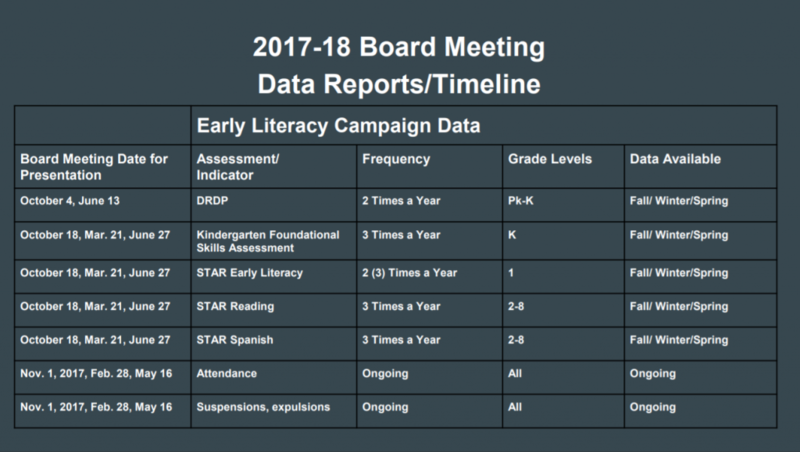 In this presentation, District staff gave clear commitments and timelines on data reporting to the Board and public. See the screenshotted commitments below. 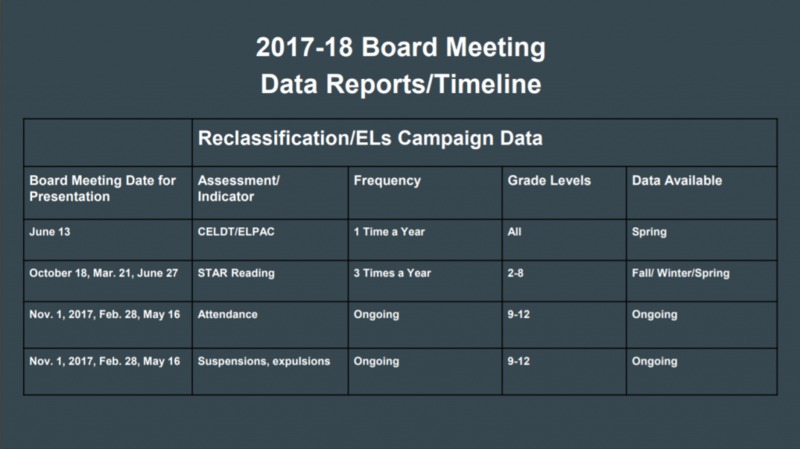 Tomorrow’s March 21st Board of Education meeting, according to the District’s commitments, was supposed to be a key meeting for our leaders and community to collectively focus on student outcomes data and progress this school year; however, there is nothing to reflect this on the meeting agenda. Click here to see the full WCCUSD Data Use Presentation (see screenshots below). Click here to learn more about our Data in Action campaign. Action Items G.1, G.2, and G.3. At the last Board of Education meeting on March 7th, the Board undertook consideration of Resolution No. 64-1718: Intent To Transition From At-Large To Trustee-Area Board Elections. During the discussion, there were procedural questions and resulting confusion about the motion on the floor. As a result, no motion carried. At this meeting, District staff are recommending that the Board reconsider the Resolution to clear up confusion. Click here to see the last Board Watch update for more on this election transition. Click here to see Resolution 64-1718 on the Transition From At-Large To Trustee-Area. Click here to see Resolution 68-1718 Authorizing the Superintendent to Seek a Waiver. Action Items G.8, G.9, and G.10. District staff are recommending that the Board ratify the Tentative Agreements between WCCUSD and UTR, WCCAA, and SSA / IFPTE Local 21. Over the course of many months, WCCUSD has been working with these labor groups to reach tentative agreement through collective bargaining on contract proposals. School districts are required to publicly disclose the provisions of all collective bargaining agreements before they ratify an agreement to ensure that the public is aware of the details. The Board will receive public comment on the proposed contract changes before voting to ratify the Tentative Agreements. Click here to see the Tentative Agreement with WCCAA. Click here to see the Tentative Agreement with UTR. Click here to see the Tentative Agreement with SSA / IFPTE Local 21.